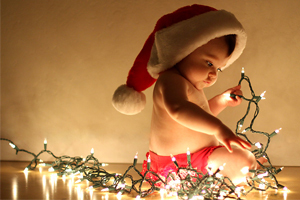 Strings of lights can be a strangulation and burn hazard for young children. Home and child care environments that are safe and childproofed 11 months out of the year can become hazardous during the holidays. Here are some things to keep in mind as you deck the halls. Choking Hazards – Baubles, bells and small decorative accents abound during the holidays. Keep a choke tube tester or toilet paper roll handy as you decorate. If an item fits in the tube do not use it or keep it well out of reach of children under 3 years of age. Also, be vigilant about watching for small items (pine needles, ornament hooks, tinsel) that may fall from decor items down to the floor within reach of a child. Strangulation – Electrical cords, strings of lights, ribbons and rope garlands can add a festive touch to your home, but items like this are a strangulation hazard. Ribbons/garlands that are 12-inches or longer and electrical cords/strings of lights of any length should be kept out of reach of children under 3 years of age. Entrapment – Bringing out special decorative items and antiques during the holidays? As you do, be mindful of slats and railings. Spaces between railings that are 3 ½” inches or greater are a head entrapment hazard. That means a child’s body can fit between the slats, but their head cannot. Falls – It’s common to move furniture to other rooms and other locations within a room as you decorate for the holidays. Keep in mind that something as simple as moving a chair across the room next to a stairway banister can create a fall hazard for small children. Tipping Hazards – Christmas trees and other decor items can tip or be pulled over by a child. Avoid clustering decor items on the floor and creating “steps” that children can climb to reach unsafe items. Also watch for cloths and other materials that hang over the edge of tables and shelves that children might use to pull items down onto themselves. Burns – Fireplaces, candles and hot holiday lights are potential burn hazards for children. LED lights are cooler and flameless candles can add holiday glow without risk of fire or burns. If you choose to light your fireplace, put up a gate or screen to keep children away. Poisonous Plants – Amaryllis, mistletoe and holly are toxic. Poinsettias aren’t poisonous, but ingesting a large amount of any plant material can cause cramping and diarrhea. It's best to display plants up high or avoid them altogether. Holidays often mean traveling over the river and through the woods to visit relatives and friends, so you'll want to be on the watch for these decor hazards when visiting others. Consider toting a portable play yard to your destination to help keep children safe when visiting other people's homes. Or better yet, have Grandma and Grandpa cuddle up with the kids on the sofa for some one-on-one play time. Finally, keep in mind that children are creative and even the most diligent childproofing might not be enough. That’s why supervision is a parent and child care provider’s best safety tool. Visit Child Care Aware Health & Safety page for more tips and resources to keep children safe and healthy during the holidays and year round.